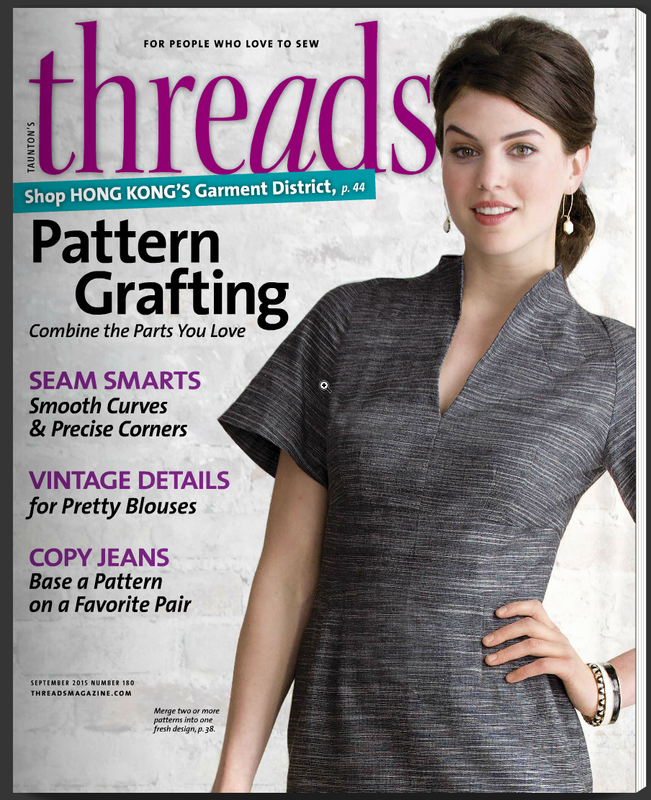 Threads Magazine is an amazing magazine full of information that every fashion sewing enthusiast would want to know. I look forward to each issue. I personally love the digital issue that I read on my iPad. In each issue they feature a story from one of their readers about a personal story they have had while sewing, called Closures. When I was making my granddaughter’s prom dress it reminded me of a story I had when I made my prom dress for my Junior year. Here is my unedited story and some real photos of the stressful, but now funny event. Featured in Threads, September 2015, number 180 issue. Prom is always such a fun and exciting day to look forward to, creating a lot of memories that last a lifetime. 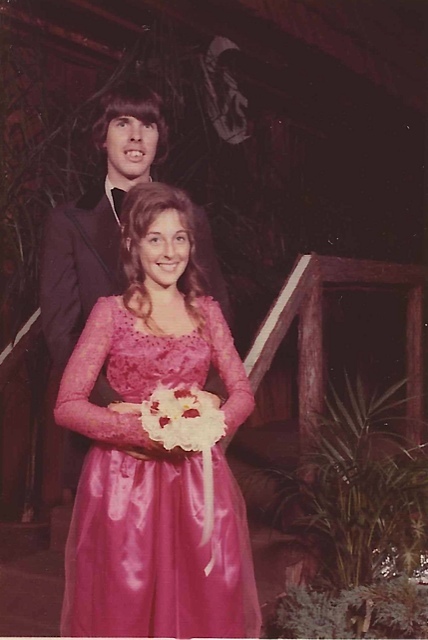 My Junior Prom in 1975 is no different and I will never forget getting ready for it. 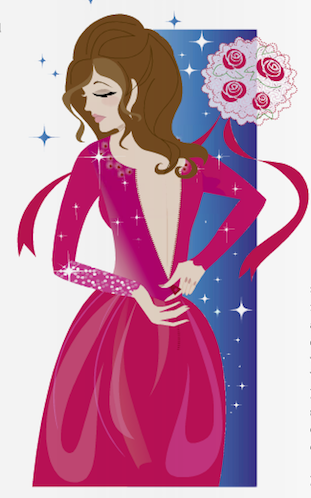 Excitement started when I was asked to go to the prom, then more excitement came when I decided to make my own dress. Growing up my mom always made my clothes, but in my teens I took that job away from her and started making my own. Now it was time to make my own prom dress. The ideas were endless. What to make? Years ago, my mom and I found an old wedding gown in a thrift store, she bought it for me to play dress up in. I loved that dress, I played in it all the time growing up. I loved the feeling I had wearing and playing in that wedding gown. When thinking about designs for my prom dress I remembered that wedding gown. I went on a mad hunt for it and I found it in a closet with other costumes, I hugged it like an old friend, and decided right then that I was going to copy this gown for prom but make it in red. 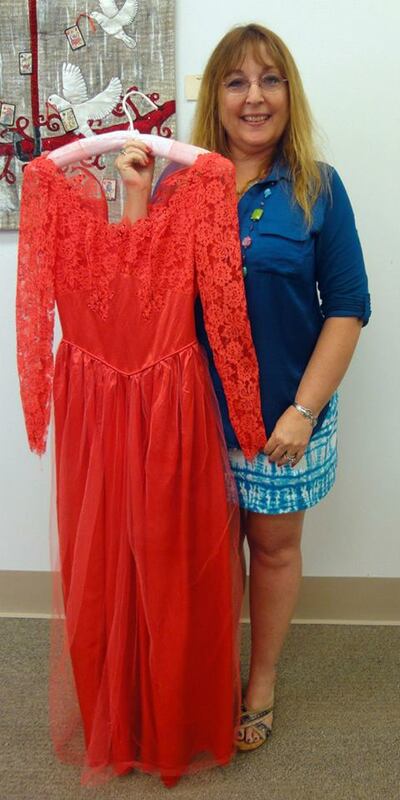 I found a pattern I could modify, picked out the perfect red satin, red lace, red netting, red sequins, and red beads. I made the perfect princess seam bodice with the point down at the waist. I carried this bodice around with me to school in a paper bag, so when I had any spare time I would hand sew sequins and beads on to the bodice. I wanted that same sparkle and elegance as that wedding gown. The night before Prom, I finally finished the beading, I sewed the bodice and skirt together, all that was needed now was to sew in the zipper. Let me give you a little history, my mom hated to sew in zippers, so she gave me that same fear. Even though I had sewn in many zippers before I had never put one in such an important dress before, so there was NO WAY I was going to do an invisible zipper in this gown. The morning of prom I am in a panic, my mom didn’t have a chance to do my zipper before she went to work. She had never let me down before so I knew she would get to it when she got home, so I went to get my hair done. When I got back, my mom was home sewing in my zipper. I was so happy to see that sight. I went ahead and started getting ready. 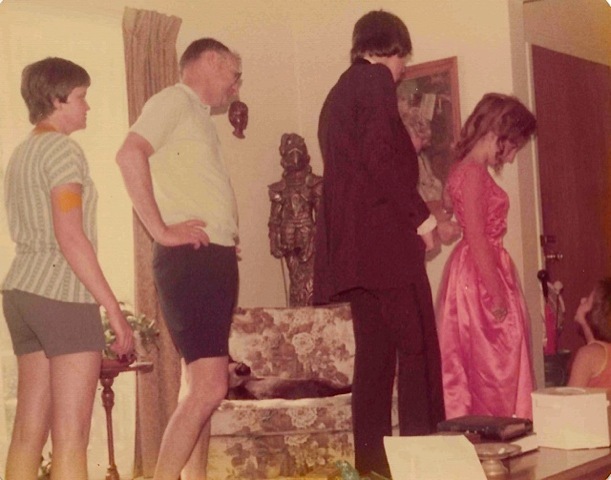 When it was time to put on this beautiful red wedding gown replicant, Prom dress, I asked my mom to zip me up. To my horror, it wouldn’t zip up past the seam at the waist because of all the gathers, piping, lace, netting, and satin. She keeps trying to zip it, I’m trying not to cry, as my boyfriend and another couple arrive. Now everyone is waiting on me. My mom isn’t having any success, my dad can’t help because he was at work, so my mom called the neighbors. When our neighbors arrived, Harvey, a rocket engineer, studied it for awhile, and said get me a pair of pliers. I thought what kind of damage is he going to do to this gown with pliers? My mom found him a pair of pliers, he grabbed the zipper tab with pliers, and started yanking at it, as my mom tried to hold the dress together, he tugged and tugged and then we heard magic to our ears, ZIP!!! It was closed!! Everyone clapped. What a relief, finally the fun could begin. I still have that dress, it is hanging in a closet with the zipper zipped up no further than that same spot at the waist just taunting me with laughter. I loved seeing this caricature that they did of me, it is amazing how they captured everything, including my bouquet. I didn’t want a regular corsage, because I was wearing a wedding gown inspired dress, so I wanted a bouquet. I was always into the details. This is what it really looked like, My mom trying her hardest to zip up my dress, my date looking on. While our neighbors Ann and Harvey studying the situation, with their daughter looking up at me and my cat sound asleep in the chair. Harvey, the rocket engineer, saved the day!! The dress fit beautifully, the reason the zipper wouldn’t go up was not because of the dress being too tight, but because I should have not taken the gathers of all those layers all the way out to the end. I should have stopped them about a 1/4″ before the zipper closure. A lesson I learned from a mishap 40 years ago. Looking back on this picture, I just want to brush my bags down on my forehead, but this is how the hairstylist wanted to do my hair, so I let her. Here I am today at an ASG meeting, telling my story and showing my dress, still with the zipper going up no further than the waist, as I say it is still taunting me with laughter all these years later. 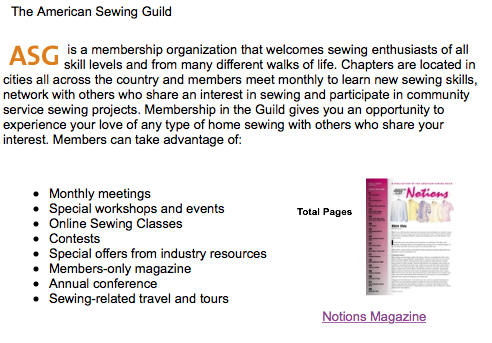 I am a proud member of ASG, American Sewing Guild, and if you aren’t a member you need to be. I love this organization made up of all levels of talented sewing enthusiasts. We have members that sew quilts, fashions, baby clothes, home decorations, etc. We have teachers from local levels to National levels. We have beginners to couture, no matter what everyone’s sewing level is, we all inspire each other. I along with three other very talented ladies were featured in Notions, a magazine for ASG members only. It is truly awe inspiring to be featured in a magazine for your peers. Following is a photo for information about ASG taken from their website to show you what we have to offer. Check out their website, come to a neighborhood meeting, and join in on the fun of being with other creative people. If you don’t have a group close by, join anyways for the discounts and opportunities to go to many fabulous workshops in other areas. You might find others around you that are interested and you can start your own neighborhood group. The ASG website is http://www.asg.org. Thanks for letting me share my excitement. 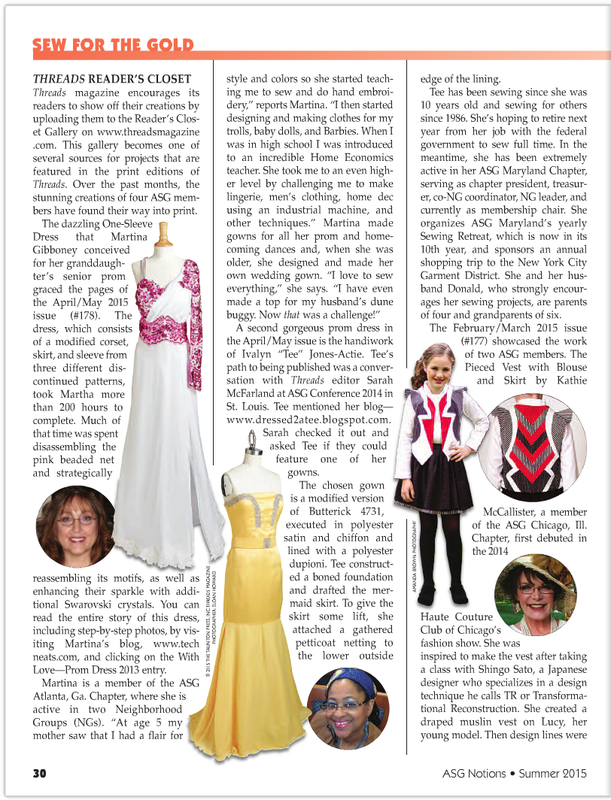 This entry was posted in Fashion Sewing, Published Sewing, Sewing and tagged American Sewing Guild, Prom, Prom Dress, Threads Magazine. Bookmark the permalink. Congratulations Martina, I am glad your fine work is appreciate, I hadn’t get the ASG magazines so I hadn’t seen the article.